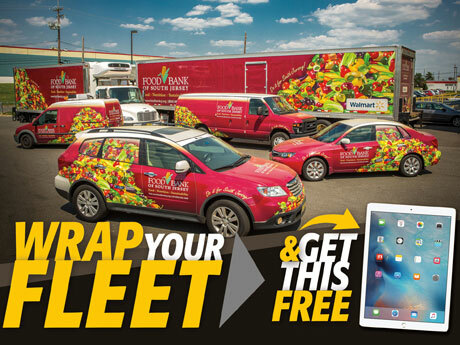 Wrapping a fleet of vehicles makes an impact like no other company advertisement. Fleet advertising boosts name recognition 15 times greater than any other form of advertising. Once vehicle wrap can generate between 30,000 to 70,000 impressions daily. When keeping brand consistency across multiple vehicles, this number of impressions can easily jump to the millions per day. Why Wrap Your Fleet vs. Paint it? With fleet wraps you can retain better resell value when you decide to retire a vehicle from your fleet. Since the wrap itself helps to protect the OEM paint finish and covers the entire vehicle, the paint finish will typically remain in prestine original condition. In addition, you have the flexibility of purchasing vehicles of varying colors since the wrap will hide the vehicle's paint color. Finally, making changes to a vehicle that is wrapped in graphics is much easier than a vehicle that has been painted with graphics. Plus, now is the perfect time to wrap your fleet! We're offering a FREE iPad Pro! HERE'S HOW YOU GET IT! Gather your Fleets' information: make, model, year and number of vehicles to be wrapped. Purchase 10 or more full coverage vehicle wraps*. You can mix and match vehicle types and still qualify! Upon completion of installation and receipt of payment, the iPad Pro is all yours! * Requires full wraps on 10 or more vehicles of any make or model, but must include printing and installation. Design services also available. Installation must be completed and final payment received prior to obtaining iPad Pro. Approximate value $900. Still have questions? Contact us at 800.516.0105 or fill out our Contact Form.